(iii) Construction of image-derived spatiotemporal models and predictive computer simulations. Researchers from all fields are invited to communicate their results focused onImage-based Systems Biology in order to exchange novel scientific methods and to share recent achievements from image-driven research in biology. Joint studies of experiment and theory will be highly welcomed. Furthermore, demonstrations of methods for accurate segmentation and classification of regions of interest or object-tracking that can be applied for high-content and high-throughput screening are of interest, as well as computational methods for translating images into mathematical models ranging from differential equations to agent-based methods. 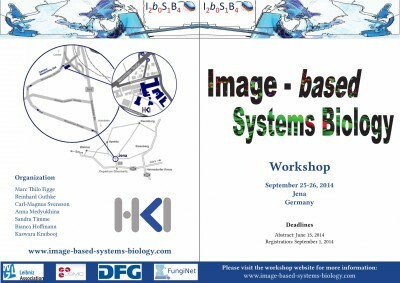 The international workshop Image-based Systems Biology is taking place biennially since the year 2012 at the HKI-Center for Systems Biology of Infection in Jena, Germany. We are looking forward to welcome you in Jena on this occasion! Please, download the IbSB 2014 workshop flyer for free distribution here. Please, download the preliminary IbSB 2014 workshop program here. We also invite contributions to a Special Issue on Image-based Systems Biology to be published in Cytometry, Part A early 2015. More information can be found here or can be downloaded here.